When Ventura and Santa Barbara Counties faced tragedies from the Thomas fire, a storm with mudslides that caused deaths and damages, we knew it was time to pause, pray and seek God’s direction for Visions of Hope. We emerged from our knees, with a NEW Date: Sunday, February 25, 2018, 3:30pm, at the Marjorie Luke Theatre, 721 E. Cota Street, Santa Barbara, CA. 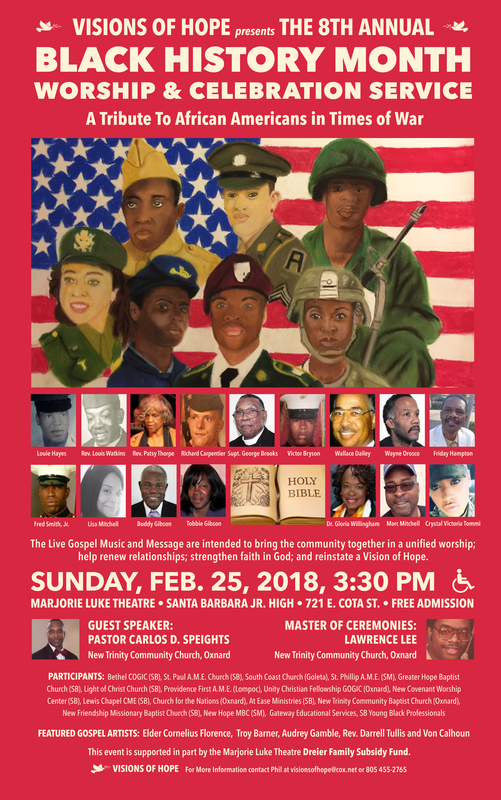 Please join us for a Unified Worship to God, live gospel music, a powerful message by Pastor Carlos D. Speights and a Celebratory Tribute to African Americans who served in Times of War.